Consuming Fires Sauces & Seasonings is a micro-business producing small batch, lightly smoked hot sauce. Launched in early 2014, Chef Ron and Teresa Jones have created Smoked Jalapeño, Smoked Habanero, and Smoked Andouille sauces. I’m so excited to tell you about Consuming Fires and their smoked hot sauces. These sauces are flavorful and delicious, and they all have the hallmark of a chef crafted small batch sauce. 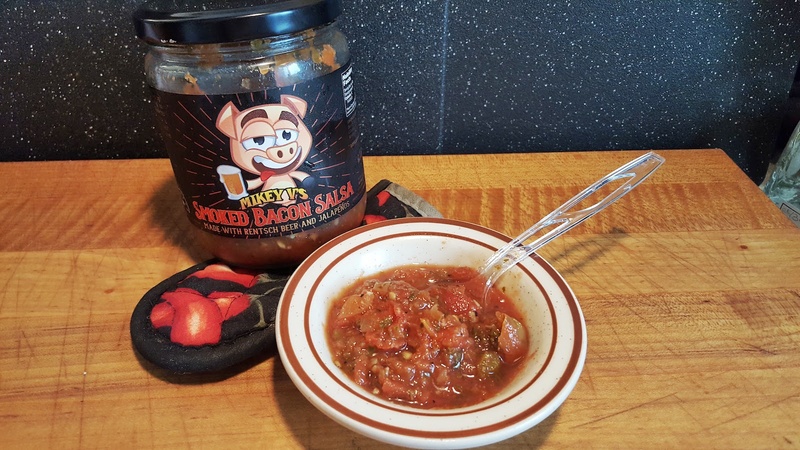 Each sauce features a smoked chile along with smoked salt for a smooth and savory flavor. This smokey profile is then coupled with apple juice, garlic, and a blend of vinegar that really makes them unique. First up, and the “one that started it all” as they say, is their Smoked Jalapeño Sauce. As you get into the story behind Consuming Fires, it’s not an unusual one. One day, a crop of peppers from a small garden, usually jalapeños, yield so many peppers that the beckoning call is “let’s make hot sauce!” And so it was with Consuming Fires. And we all benefit from that. Overall rating: – Very good. 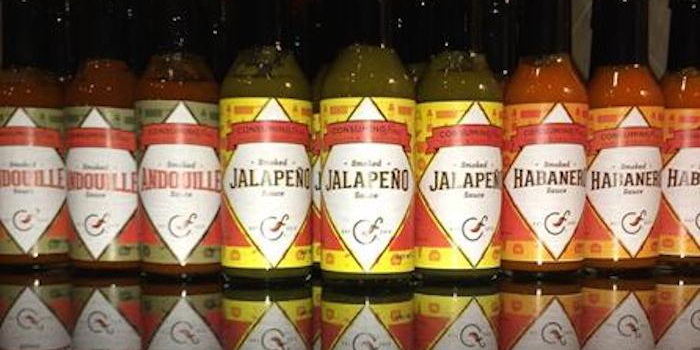 Once upon a time, jalapeño sauces were simply peppers, vinegar and salt. Green, slimy and boring in my opinion. But in the past 5 or 6 years, jalapeño sauces have improved immensely – with craft makers adding new ingredients and flavors to the base of jalapeño. 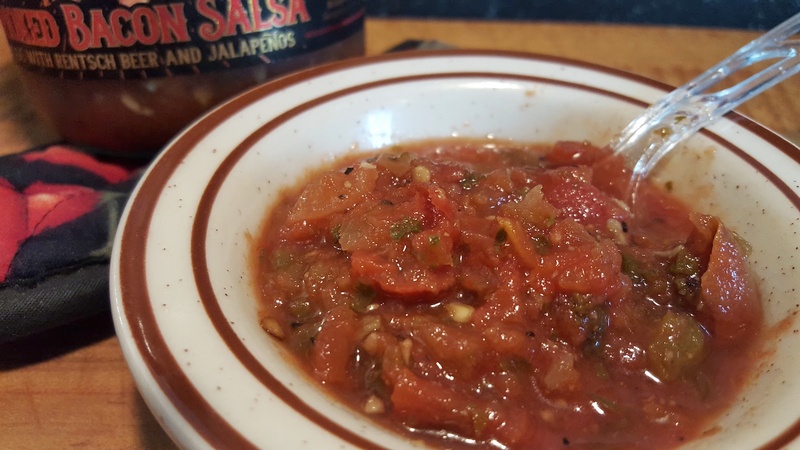 Consuming Fires’ Smoked Jalapeño Sauce is a great example of what can be done with a few choice ingredients and some talent from a chef like Chef Ron. Ingredients: smoked jalapeños, apple juice, onion, cider vinegar, white vinegar, garlic, smoked salt. Texture and Appearance: This bright green sauce is barely thick – just slightly thick. The very smooth appearance shows almost no bits or ingredients floating about. This is a simple sauce. But it does coat the neck of the bottle and so deserves the “barely thick” description. The aroma is very smoky and sweet followed up with onion and vinegar. Fragrant. Taste Straight Up: First taste, straight up, is of a smoky, sweet, peppery sauce. The vinegar flavor is there, but not overwhelming. 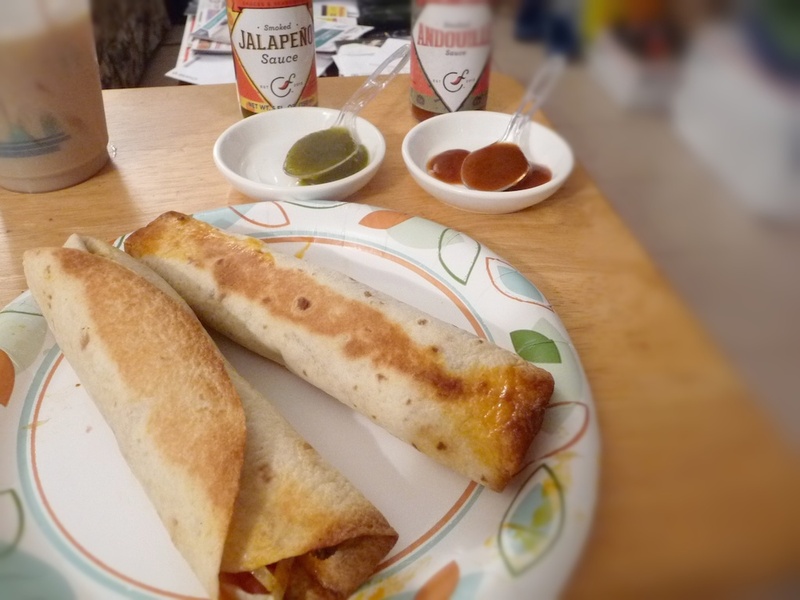 There is a strong amount of smoke that stays with you as the heat from the jalapeño subsides. Fans of jalapeño sauces will love this one. A bright and fresh finish tells us this is hand-crafted and bottled fresh. It’s all good stuff here. Delicious. 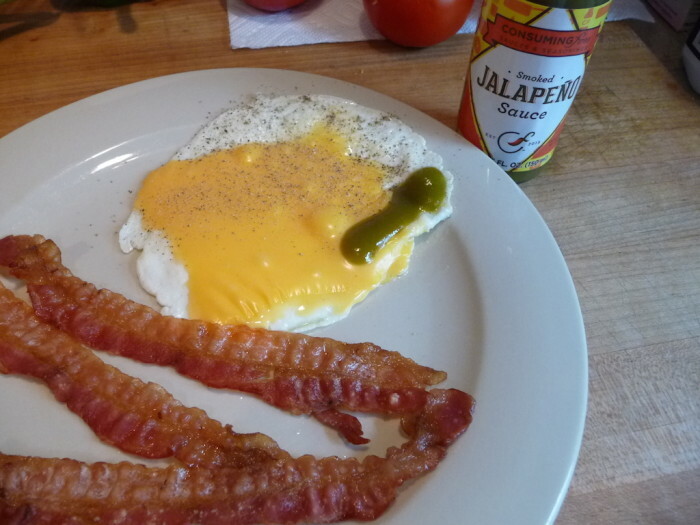 smoky green jalapeño on egg – yummy! Taste on Food: I’m a sucker for anything smoked – especially peppers and sauces. On my simple fried egg with cheese, this sauce brings a wonderful sweet and smoky flavor to it. The fresh green jalapeño flavor really shines here. The garlic and vinegar add their own zing to the mix. Delightful. We like to comment on labels, graphics and packaging, when it’s warranted. And here, Consuming Fires keeps it simple. The label sports a small banner that says “Consuming Fires Sauces & Seasonings”. I’m hoping the “seasonings” part shows up on their menu someday. Their logo is a nice clean graphic with a little chile pepper incorporated into the “F”. Other than the title of the sauce, the labels stay the same on all 3 flavors – save a slight background color change among each. 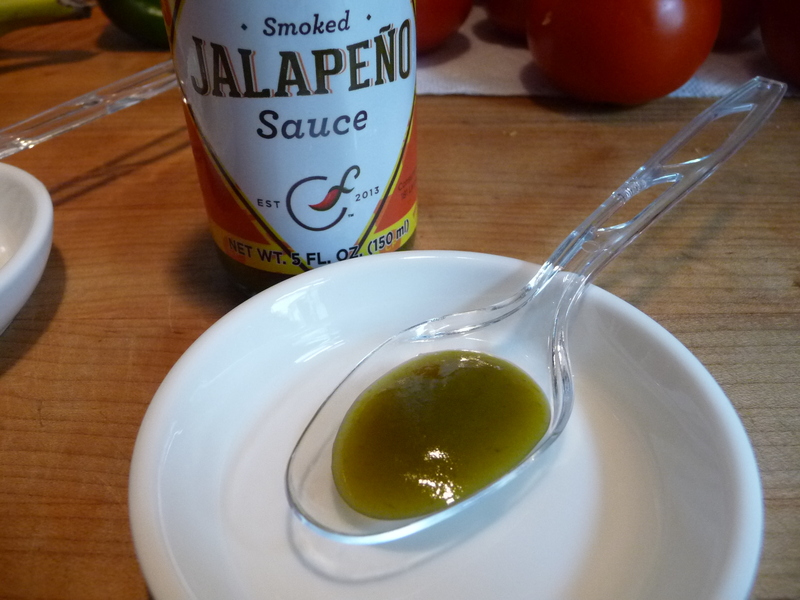 This simple, mild, delicious Jalapeño sauce is a great choice for those that like just a little heat, and that classic Jalapeño flavor with a big touch of smoke. We’ll have reviews of Consuming Fires’ other two sauces posted soon. Meanwhile, you can find them at the following places on the web. Disclaimer: We received this product via the manufacturer’s KickStarter campaign.